Vibraphonist Terry Gibbs has had what must be one of the longest careers in jazz. He was born in New York City on October 13, 1924, and twelve years later he won the Major Bowes Amateur Hour contest, an event that marked the beginning of a musical career that is still alive and well today, well over 90 years later. Three years ago I wrote about another Terry Gibbs album, one he recorded along with clarinetist Buddy DeFranco, 1999’s “Terry Gibbs and Buddy DeFranco Play Steve Allen.” For further biographical information about Gibbs, I’ll refer you to that review and a few links at the bottom of this one. The opening song, “Tico Tico,” was written in 1917 by the Brazilian composer Zequinha de Abreu. Abreu died in 1935, so there is no way of knowing what he would have thought of Bill Holman’s arrangement and Gibb’s big band presentation of his classic song. I’ll just say it wears its age well, with great solos from Gibbs, Candoli, and Rosolino. “Big Bad Bob” is followed by the title track, “The Big Cat,” which was written and arranged by tenor sax legend Al Cohn. This one opens with a bit more of a mellow bent than the previous two tunes, but it’s impossible to have that much brass involved in a song and not have it cook, even if it is at a somewhat lower level of heat. This is an excellent song, with outstanding solos from Gibbs, Maini and Condoli. Moving ahead we come to “Do You Wanna Jump, Children?” This one was written by Willie Bryant, Al Donahue, James Van Heusen, Victor Seisman and Victor Selsman (whew!). That’s a lot of people to write what turned out to be one of the shortest songs on this album. It is also the only vocal, another group effort featuring the entire band. This one doesn’t dilly dally around but takes off flying right away, with the guys in the band doing a creditable job with the chorus. Solos to listen for (on their instruments, not singing!) are Gibbs and Maini. “The Big Cat” is a pleasant mix of standards and unknowns. The next song is definitely in the standards camp, the long-time classic “Nature Boy.” This is, I am sure, one of the most-recorded songs ever, most famously by Nat “King” Cole. Which was not a bad thing at all for the composer, a gentleman by the name of Eden Ahbez. Gibbs and company do an excellent job with Manny Albam’s arrangement. The last song I’m going to write about for this one is the penultimate track, “Jump The Blues Away”, written by Elliot and Edward Lewis. Al Cohn’s arrangement and the band’s execution of it are flawless. Solos to appreciate: Gibbs, Moran, Kamuca. 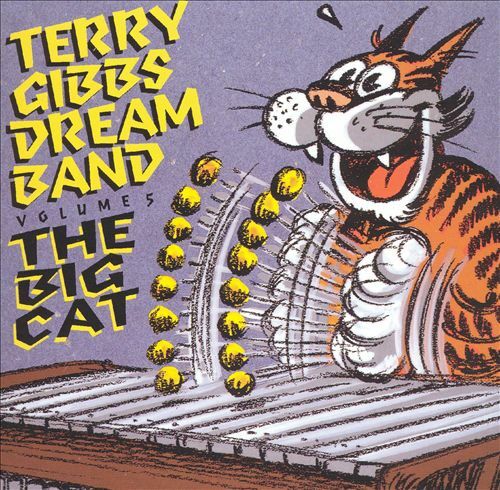 Needless to say, I am fairly certain you’ll find “The Big Cat” from Terry Gibbs Dream Band to be an excellent addition to your personal playlist, for a Saturday or any other night! To find out more about Terry Gibbs and his music, a great place to start would be his web site. Concord Records also has a nice bio page for him. And I wrote a bit about Gibbs and his then-partner, Buddy de Franco, for JFASN #42. You’ll find more references as well there. PS: Don’t forget! The 35th annual Cathedral Park Jazz Festival is underway through tomorrow night, beneath the St. Johns Bridge along the banks (or within throwing distance, anyway) of the Willamette River in North Portland.